Elisabeth from Black Pearl Press just scanned this photo from Martha Stewart Living in for me! 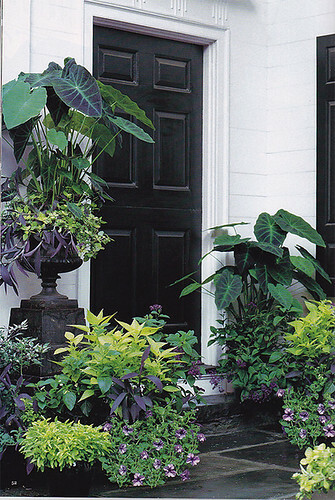 I love the black door with the slate walkway paired with overflowing pots of green. So pretty. I think the key to my patio will be adding layers of planters at different heights. This is stunning. It makes me want to paint my door black or at least get a whole boatload of plants for the walkway . . .
love this! the purple is especially nice with the greens and the black door.